Lime mortar, and similar lime-based materials, such as lime plaster or lime wash, are vitally important in repairing old buildings. Lime mortars, renders and plasters have a different consistency to their modern cement-based counterparts; this is because lime produces soft textures and mellow colours when mixed with natural earth pigments. Most important of all, it’s porous so allows a wall to breathe and shed moisture, thus avoiding damp. Read our expert guide to using lime mortar, lime plaster and lime wash to repair and maintain your period home. For more on transforming your home's exterior, see our complete guide. To make lime, limestone, chalks or seashells formed of calcium carbonate are burned to form quick lime. Evidence of this process dates back to prehistoric times and lime kilns were once a common sight in most villages, although they were often temporary structures. Lime began to be burned on a large scale during the Industrial Revolution and it was used not only in buildings but also in agriculture and industry. There are two basic types of lime: nonhydraulic and hydraulic. Non-hydraulic lime is produced from pure limestone and comes in the form of lime putty, which offers the greatest flexibility and breathability of all the limes. Hydraulic limes are produced from limestones with naturally occurring impurities that contain a range of setting agents. Supplied in powder form, they start to set when they come into contact with water. A third type of lime is hydrated or ‘bagged lime’ which is fundamentally a powdered form of non-hydraulic lime putty but is not generally recommended as a substitute. What are the benefits of Lime? Environmentally-friendly: when the cement was invented in 1824, it was first used in civil engineering projects. Unlike lime, cement is inflexible and lacks porosity so can be a direct cause of damp when used in old buildings. In the early 1900s, it began to be used in the construction of homes, although it was only after World War II that its use became commonplace and, by the 1950s, traditional lime products were little used. Today, they are undergoing a revival due to the rediscovery of traditional building techniques, their ‘green’ credentials and attractive appearance. Find out more about combatting damp and rot in old homes. Walls can breathe: an understanding of lime is essential if you plan to work on a traditionally built building whether you are repointing, rendering, plastering or rebuilding walls. If you use the wrong materials, such as cement-rich mortars or renders or modern impermeable paints, you are likely to be storing up future problems. The need for old buildings to breathe, so damp and other problems are avoided, cannot be over-emphasised and by using lime you will allow this to happen. Find out more about renders and how to render walls with our guides. 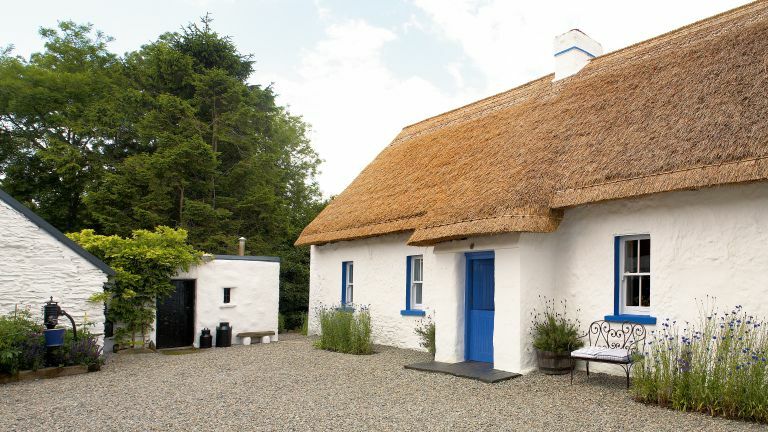 Kevin Bergin repointed the walls of his 17th century thatched cottage using lime mortar and finished them with 12 coats of limewash. Choosing the right lime products is key but should not be daunting. Using ready mixed lime mortars and limewashes makes life easy and, generally, lime suppliers are happy to offer advice. If you want to learn more there are a variety of practical courses available. If you are employing a builder who is unfamiliar with using lime it is well worth encouraging them to have training. As well as there being several types of lime, hydraulic lime comes in a variety of strengths with the prefix NHL (natural hydraulic lime), for example NHL 2, NHL 3.5 and NHL 5, depending on the proportion of clay and other impurities contained within the original limestone. These impurities act as setting agents and the higher the number the less flexible and breathable the mortar will be and the better suited to harsh weather conditions. This means that a suitable mortar can be created for any situation. Lime is highly alkaline and can burn your skin so wear goggles and gloves and, when dealing with it in a powdered form, wear a mask. Having some water to hand to wash away splashes is advisable and clean your hands afterwards. 1. Limestone is burned at between 900°C to 1300°C to create quick lime, the raw material needed to create products ranging from mortar to plaster. 2. Concentrated dry quick lime is poured into a tank of water ready to be slaked or mixed to form calcium hydroxide. The process triggers strong chemical reactions, such as bubbling and hot steam, and protective gloves, goggles and breathing mask are necessary. 3. After three months, the fully matured lime putty can be dug out of the tank. 4. You can tell when lime putty is fully mature because it has the consistency of cottage cheese.